Just what the Doctor ordered. The biggest and best name in electronic music Hospital records have teamed up with Signature Brew to create the ultimate beer to dance with. It’s a devilishly simple yet sophisticated lager. Brewed independently, this unique recipe was developed through long and arduous tasting sessions with Hospital records staff and artists. It had to have top end, it had to have a strong bass and above all it had to be original. Playful Saaz hops dance throughout the malt forward bassline in harmony creating a technicolour flavour matched only by its creators. This Vienna style lager is never excessive but instead gratifyingly balanced with enchanting licks at every beat. Turn the music way up and get this beer down your neck! 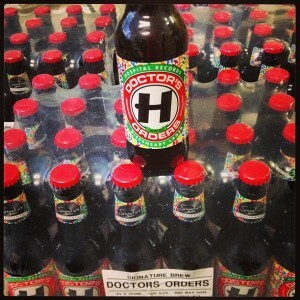 Doctor’s Orders is the signature beer of Hospital Records. We have spent time in the lab perfecting the composition, carefully trialling blends and selecting only the very best ingredients for the ultimate refreshing, easy-drinking lager. Doctor’s Orders is ideal for pre and post Hospitality rehydration and boasts a unique character with a crisp balance of malty bassline weight and lively hoppy top end. Must be served chilled at around 174bpm. Please note: as it’s alcohol, you must be over 18 to purchase it, and because it’s coming direct from the brewers, it must be ordered separately from other Hospital Records goodies.